VIM Team building a casita for a family in Rio Bravo Mexico. Your church is probably involved in some sort of mission/outreach ministry. This may be through church groups or the church as a whole doing local missions and outreach ministry. Your church may actually operate and/or house the ministry or you may support a community ministry. These may be ongoing or as-needed ministries. There are a wide variety of such ministries – food banks and other feeding ministries, thrift stores, support groups, shelters, and the list goes on. It might also be through your mission teams who journey to places within in the Conference, to domestic locations or to international locations to minister in the name of Jesus. First – we would like to hear the stories of your outreach ministries and mission journeys and see some pictures. Please share here. Then, AR UMVIM wants to introduce you to additional missions/outreach opportunities. 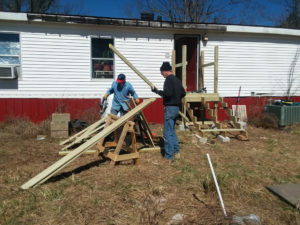 Jasper UMC VIM Team serves in their community doing minor repairs and building steps for access to a mobile home. Hands & Feet Ministries is lending a helping hand in your own community. Sharing God’s love with no strings attached. Acts of service done for those in need at no cost to the recipient. May include wheelchair ramps, handrails, lawn and garden work and minor home repairs. These can be coordinated in cooperation with DHS, Home Health Agencies, Hospital Social Workers, Area Agency on Aging, etc. A VIM Team from Greenwood UMC serve in This Old Church, a ministry that does minor repairs on smaller, older churches. 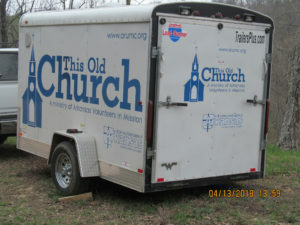 Partnering with small older churches in need of repairs. 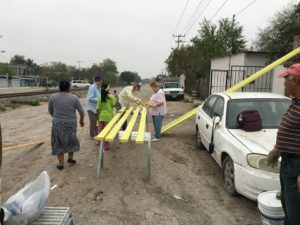 Coordinating with the church to provide labor and materials. Ideally the church will provide materials and volunteers from your church will furnish labor. Painting, drywall, flooring, minor repairs are among the tasks. Plumbing and electrical must be done by licensed professionals. Your church may be led to fill gaps in funding, materials, etc if needed. Coordinated through ARUMC VIM. Teams coming into our conference from other conferences need places to stay and prepare meals. They may also need help coordinating projects in the local area. Contact your AR UMVIM Coordinator for further information and training to become a Volunteer Team Host Site. Feeding Ministries, Food Pantry, Clothes Closets, Health Fairs, Movie Nights, Mom’s Day Out, Community Celebrations, Single Family Fire, etc. AR VIM wants to hear the stories of how your church is serving in your local community. Mount Sequoyah Conference and Retreat Center: Spring cleanup and garden work, building repairs and maintenance. Storm cleanup: after floods, tornados or ice storms. Funds are always needed for work projects in our conference. Churches and individuals may contribute by sending donations to the Conference Treasurer designated as VIM funds. Tornadoes, Hurricanes, Floods, and Wildfires…Volunteers in Mission Recovery Teams are always needed after devastating storms in our own conference, jurisdiction, across the nation and internationally. Numerous domestic sites are approved as Volunteer in Mission sites. Arkansas VIM teams are currently serving at several international sites such as Costa Rica, Guatemala, Mexico and Haiti. Below are links to project and mission opportunities in the US and internationally.